BullGuard Antivirus is a straightforward security tool that will detect and block malware before it can harm your PC. The program includes strong real-time protection measures, for instance, scanning downloaded software for malicious intent or incoming emails and the files you access, looking for potential dangers. A "Safe Browsing" module blocks access to known dangerous sites, reducing your chance of becoming infected in the first place. 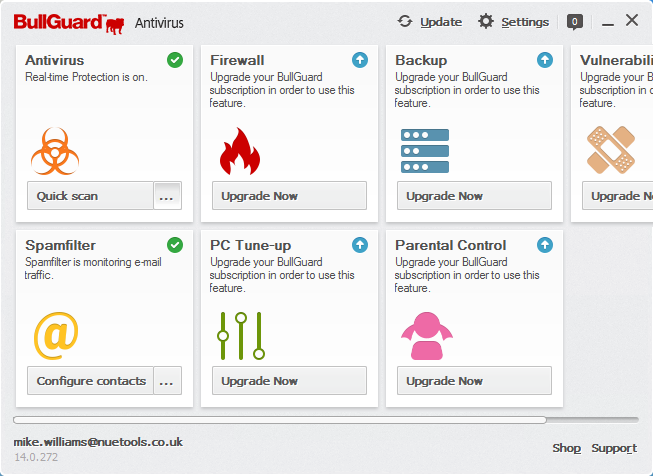 BullGuard Antivirus also monitors the behaviour of everything running on your PC, looking for anything suspicious, which allows it to detect even some brand new, previously undiscovered threats. The program's core antivirus engine can then run scheduled scans every day, week or month, to check for anything that may have slipped through the net. Or of course, you can run additional scans whenever you like. And you also get BullGuard Vulnerability Scanner, which will look at your network and check for potential opportunities which could open up access to intruders. The new Game Booster module will attempt to maximise your gaming performance by stopping background tasks which could slow your CPU. A redesigned and simplified interface clearly displays all the suite's modules and their current status. What's new in 19 (see release notes for more)?